Emily Blunt, holding the movie in her impeccably gloved hands, makes Mary Poppins her own. But this is no one-woman show; every role here is cast perfectly, from Lin-Manuel Miranda's song-and-dance man to Meryl Streep’s enchantingly goofball cameo. Rating: 4 stars out of 4. Set some 20-odd years after the events of the first film (which places us sometime in the early 1930s, or as the movie puts it, The Great Slump), “Mary Poppins Returns” unfolds in a manner similar to the first movie, and to each of author P.L. Travers’ books. 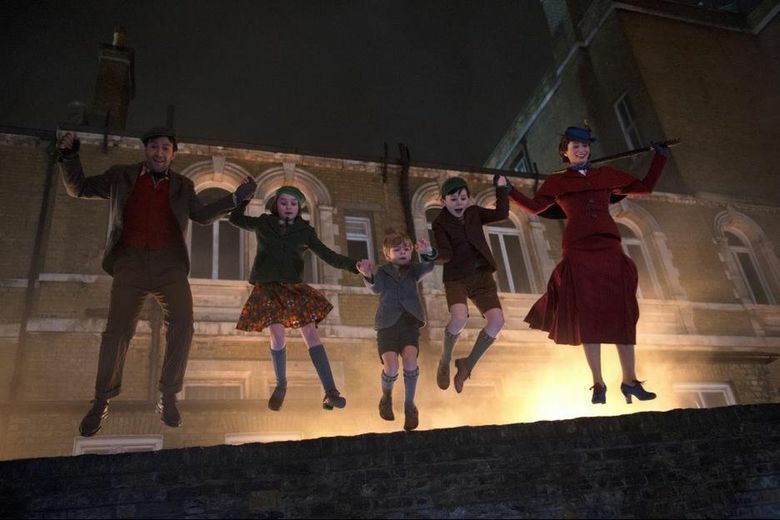 Mary Poppins arrives by means unexpected, takes the Banks children on a series of episodic adventures and vanishes once her work seems done. That’s what happens here, for a new generation: Michael Banks (Ben Whishaw), a recent widower and dreamy soul, is struggling to keep things together for his children Annabel (Pixie Davies), John (Nathanael Saleh) and George (Joel Dawson); his more practical sister Jane (Emily Mortimer), now a labor organizer (shades of her suffragette mother), tries to help. Despite a jaunty pre-credits song performed by a lamplighter named Jack (Lin-Manuel Miranda, charm personified), this London at first seems made of gray clouds, damp sidewalks and Depression-era worry. 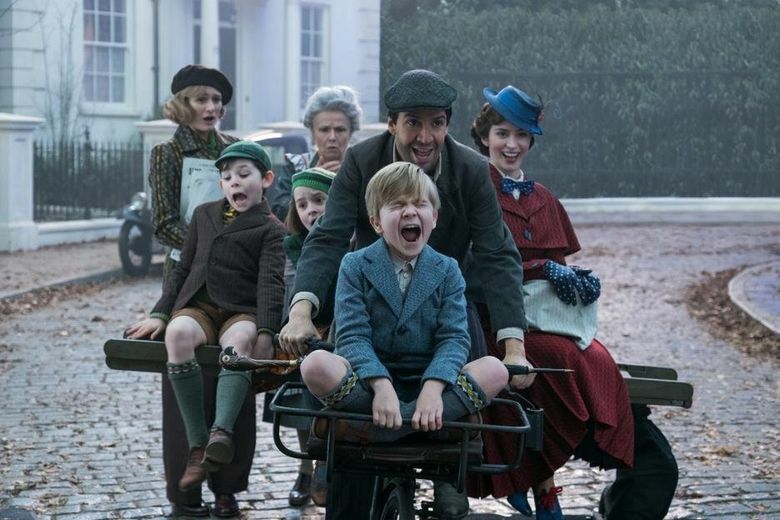 Blunt’s marvelous, but “Mary Poppins Returns” is no one-woman show; every role here is cast perfectly, from Miranda’s irresistible song-and-dance man to Meryl Streep’s enchantingly goofball cameo (in which she gets to recycle, to comic effect, her “Sophie’s Choice” accent) to the younger Banks children, each of whom is utterly adorable without the self-consciousness of so many movie kids. And two nonagenarian Disney veterans show up late in the film — if you haven’t heard their identities, I’m not about to spoil it for you — just to give the tear ducts another workout, and to remind us that singing and dancing knows no age. Marc Shaiman’s score, sprinkled with references to the original like sugar on a cookie, weaves a web of enchantment around the characters, and the all-new songs are like loving homages. You see the 1964 “Mary Poppins” everywhere — in the lettering of the opening credits; in the hand-drawn animation sequence (yes, the penguin waiters are back! ); in the pale-gray London twilight and the grumpiness of Admiral Boom and the wet green of the park. It’s a movie that’s delicately haunted by beautiful ghosts; both that of the children’s late mother (in whose memory they, and their father, learn to find joy), and of the first movie itself. “I thought we’d never see you again,” says Jane slowly to Mary Poppins early on, her voice thick with wonder. I thought so, too. Never underestimate the power of movie magic. ★★★★ “Mary Poppins Returns,” with Emily Blunt, Lin-Manuel Miranda, Ben Whishaw, Emily Mortimer, Julie Walters, Pixie Davies, Nathanael Saleh, Joel Dawson, Colin Firth, Meryl Streep. 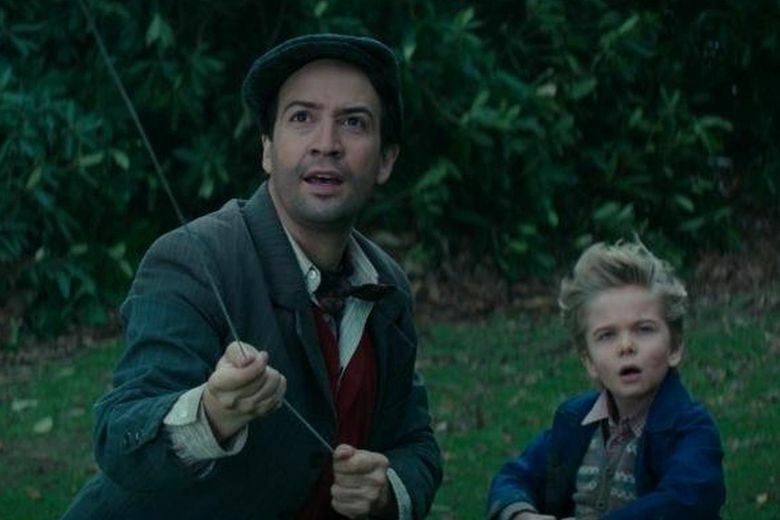 Directed by Rob Marshall, from a screenplay by David Magee, based on the Mary Poppins books by P.L. Travers. 130 minutes. Rated PG for some mild thematic elements and brief action. Opens Dec. 19 at multiple theaters.